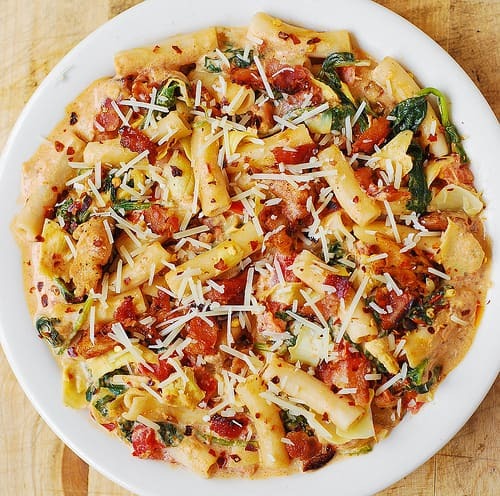 Spinach and Artichoke Chicken Pasta with Bacon and Tomatoes in Asiago Cream Sauce – yummy pasta with lots of veggies! If you love artichokes – this is the recipe for you! 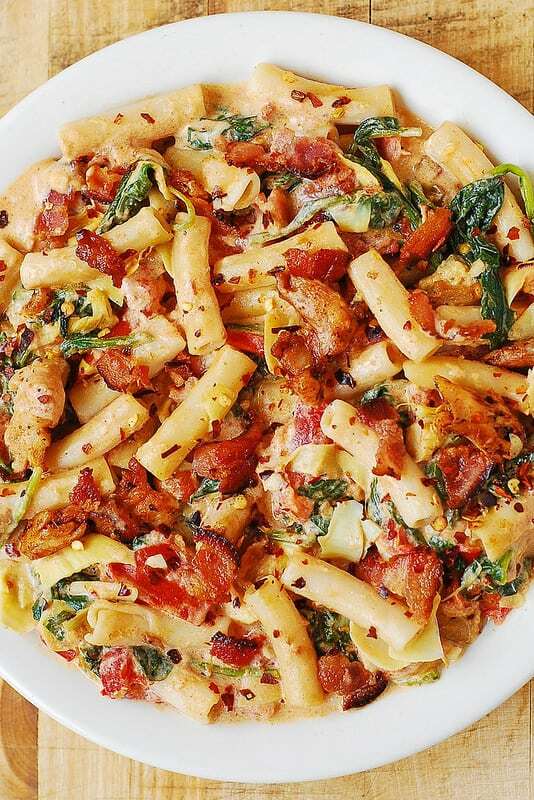 The vegetables are smothered in such a delicious Asiago cream sauce (and crumbled bacon) that even non-veggie lovers will love this spinach and artichoke chicken pasta! 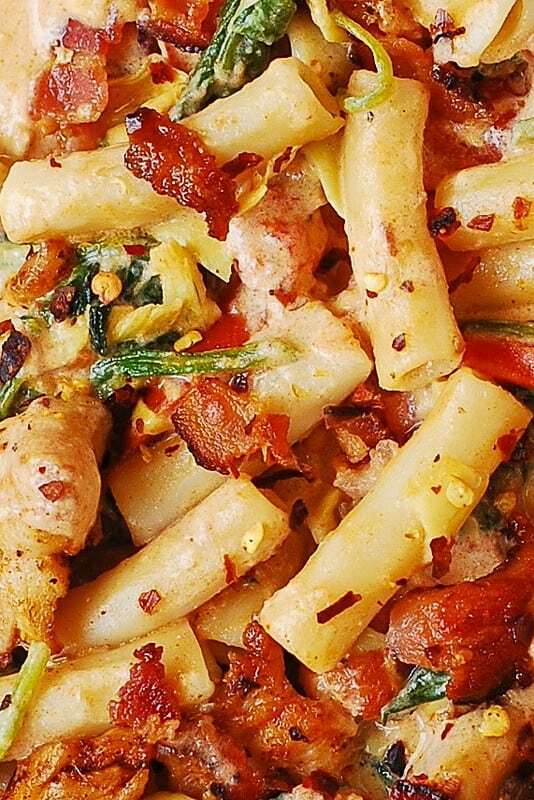 Asiago cheese and bacon provide a ton of flavor to this chicken pasta. Make sure to season your sauce with enough salt (I recommend 1/4 teaspoon of regular salt in this recipe) and a small amount of crushed red pepper flakes. 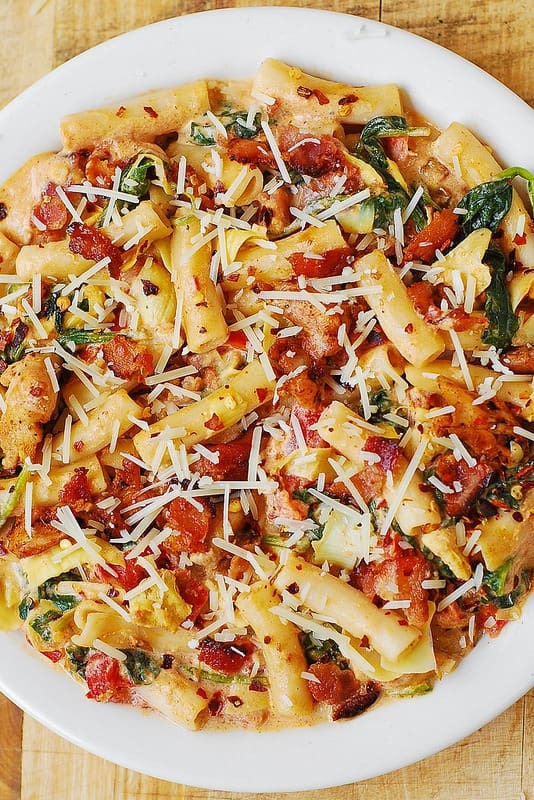 Here is how easy it is to make this Spinach and Artichoke Chicken Pasta with Bacon and Tomatoes. 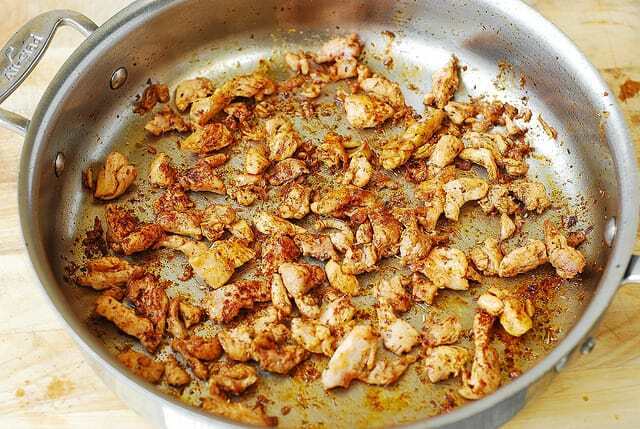 Start by cooking sliced chicken, sprinkled with paprika and Italian seasoning, on medium heat in 1 tablespoon of olive oil in a large skillet for 4-5 minutes on both sides until the chicken is completely cooked through. I used thinly sliced boneless and skinless chicken thighs – they are very flavorful! Remove the chicken from the pan. 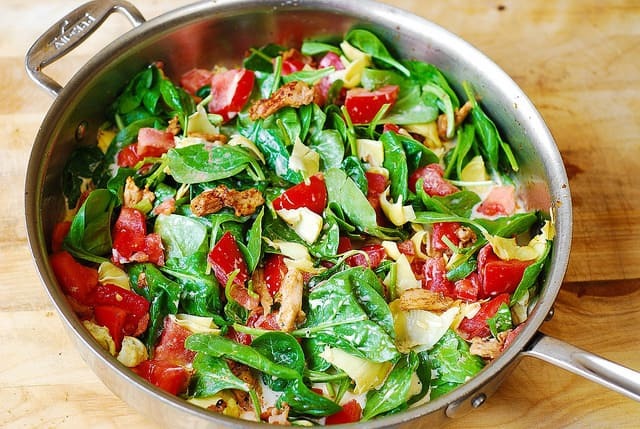 To the same pan (but without chicken), add fresh uncooked baby spinach, chopped tomatoes, artichoke hearts from the can (drained REALLY WELL and roughly chopped), 1/3 of the cooked chicken, crushed red pepper flakes, minced garlic, and half the bacon (already cooked and drained of fat). Mix everything. Reduce the heat to simmer, and keep stirring until spinach starts to wilt (don’t let it wilt too much and overcook). Now you’re finally seeing the cream sauce and not just the spinach as in the previous picture. As spinach starts to wilt and reduces considerably in volume, add grated Asiago cheese, and keep stirring on medium simmer until the cheese melts and makes the sauce creamy, only about 1 minute (at most 2 minutes). Then, immediately remove from heat. Season the Asiago cheese cream sauce with salt – I use 1/4 teaspoon of regular salt and that’s usually perfect. You might want to use more salt if needed. In the mean time bring a large pot of water to boil, add pasta and cook it according to instructions. Drain the pasta, rinse with cold water and drain again. Add pasta to the skillet with the Asiago cheese cream sauce and the vegetables, stir to coat well, and reheat. To serve, add the remaining half of bacon (cooked and drained of fat) and the remaining 2/3 of sliced chicken (warmed) on top of pasta either right in the skillet or in the serving plates. 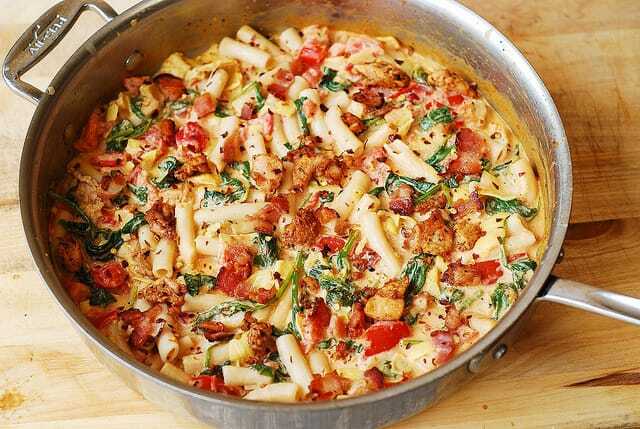 Top with grated Asiago cheese and serve this Spinach and Artichoke Chicken Pasta with Bacon and Tomatoes in Asiago Cream Sauce to your family and friends and yourself! 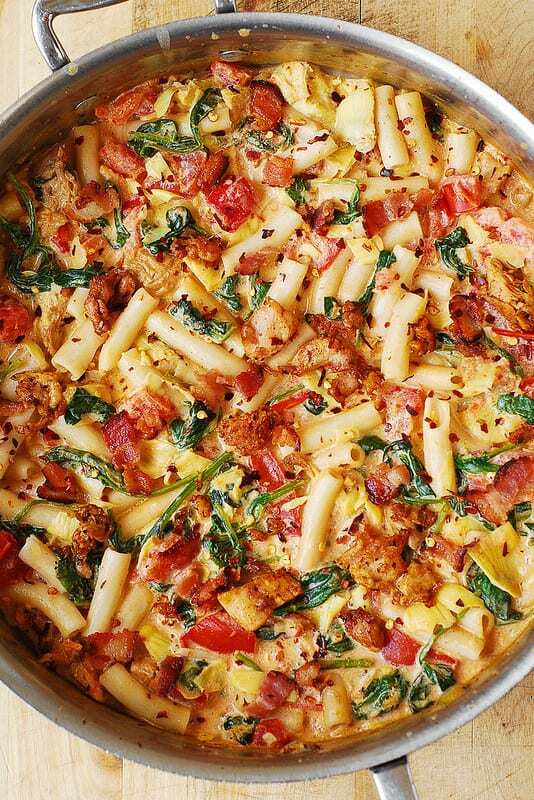 Spinach and Artichoke Chicken Pasta with Bacon and Tomatoes in Asiago Cream Sauce - yummy pasta with lots of veggies! If you love artichokes - this is the recipe for you! In a large skillet, heat 1 tablespoon of olive oil until hot on medium heat. Add sliced chicken (I used thinly sliced boneless and skinless chicken thighs - they are very flavorful! ), and cook sliced chicken on one side on medium heat for 1 minute. While it cooks, sprinkle the uncooked sides of the chicken with paprika and Italian seasoning. Flip the chicken over, and cook on the other side for 2-4 more minutes on medium heat, until the chicken is completely cooked through. Remove the chicken from the pan. 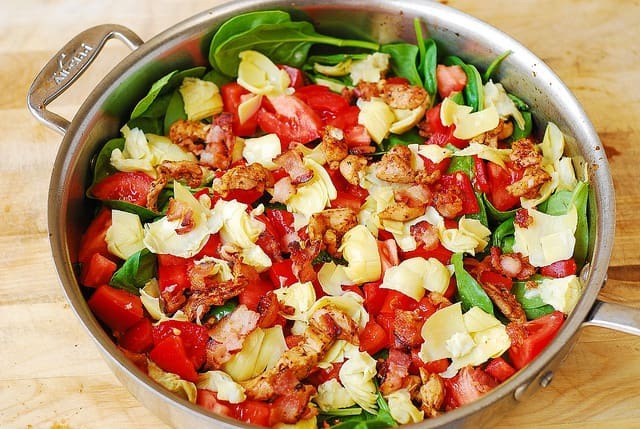 To the same pan (but without chicken), add fresh uncooked baby spinach, chopped tomatoes, artichoke hearts (drained really well and roughly chopped), 1/3 of the cooked chicken, crushed red pepper flakes, minced garlic, and half the bacon (already cooked and drained of fat). Mix everything. Add half and half and bring to boil. Immediately reduce to simmer, and keep stirring until spinach starts to wilt (don't let it wilt too much and overcook). 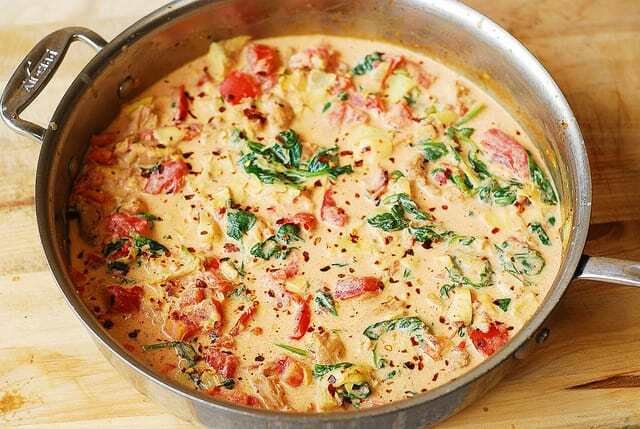 As spinach starts to wilt and reduces considerably in volume, add grated Asiago cheese, and keep stirring on medium simmer until the cheese melts and makes the sauce creamy, only about 1 minute (at most 2 minutes). Then, immediately remove from heat. Season the sauce with salt - I use 1/4 teaspoon of regular salt and that's usually perfect. You might want to use more salt if needed. Add pasta to the skillet with the sauce, stir to coat well, and reheat. To serve, add the remaining half of bacon (cooked and drained of fat) and the remaining 2/3 of sliced chicken (warmed) on top of pasta either right in the skillet or in the serving plates. Top with grated Asiago cheese. I made this and oh man was it delicious! I used orecchiette pasta because I had it on hand and I used half smoked Gouda cheese. Highly recommend! Any recommended adjustments if we did not add bacon? No, no special adjustments. Just skip the bacon if you don’t want to use it and follow the recipe as is. Why do people reply with “sounds delicious”, why not make it and then tell if it is delicious. “looks delicous, sounds delicious’, doesn’t help me. I already know that! 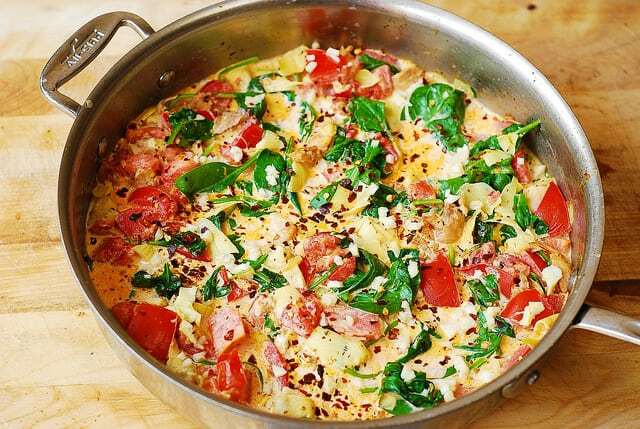 I am definitely going to try this recipe–it looks so delicious and mouthwatering! also loved the detailed instructions. Thanks. Trying one of the pasta dishes now, looks absolutely delicious! The spinach looks so good and delicious, thanks for sharing with us these pictures and detailed recipe.